"I know I'm the king when I jump in the ring." The fighter's swagger still courses through Wally Carr. 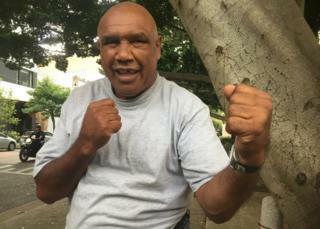 One of Australia's best Aboriginal boxers, Carr enjoyed a stellar career that spanned 100 professional bouts over 15 years, but later he became a drug-dependent alcoholic who was forced to sleep in abandoned houses. "I parade, I show off," Carr tells the BBC in Sydney. "Probably the only person in the world that can do it the way I did it was Mohammad Ali because I danced, I smiled. I was very good, I've never been counted out." But beneath the showman's bluster there is a lingering sense of injustice that Australia has never fully appreciated his remarkable achievements. Born in the New South Wales community of Wellington, Carr was taken from his mother as a young child and brought up by "six different families in six different towns". It was the bullying and beatings at the hands of schoolyard thugs that would stir a fighter's instinct and forge a path to a life in the ring. "I came to Sydney when I was 16 and I stayed with my aunty," he says. "She had the TV on one night and the fights were on, and all these blackfellas are fighting. I said, 'Aunty, how much do the blackfellas get a fight?' She said A$50 (£29; $36), A$100 a fight. I said, 'Oh, fair dinkum?' I said, well, that's me - I am going to learn to fight - because I was only getting A$32 a week wages." His first visit to the gym was a gory experience, but even in those very early days he showed a fierce sparring partner what he was made of. "He punched the so-and-so out of me," Carr says. "I had blood pouring out of me but I wouldn't go down, naturally, and the trainer said, 'You're not real good at fighting, brother, but you've got plenty of ticker.'" Carr is 63. He is a tall and charismatic, and bears contorted teeth - a reminder of past battles that saw him hold 12 titles in six divisions. He quit boxing in the mid-1980s, but by then his life had begun to unravel. Gripped by drug and alcohol addiction, he became destitute. It would be the toughest fight of his life. "I slept in a park for three years, slept in empty houses, very heavy on marijuana, very heavy on cocaine, and one of my daughters came over to visit me and found me on a footpath," he recalls. "I'd just had a heart attack. I just said enough is enough and I stopped everything that day. And at the moment I'm going very well." Seven years ago, Carr was introduced to Australian author Gaele Sobott, who agreed to write his story of struggle and success. The project took the pair from the male-dominated world of boxing to the desert, and into close-knit rural communities. The book, My Longest Round, is laced with tales of gangsters, hunting goannas (a type of lizard) and indigenous politics. "Wally was the last of the 15-rounders, so it is something that should be spoken about more," Sobott says. "Although there has been some recognition since the book, there could be more, definitely. [His story] is a metaphor for what is happening in Australia. It is a metaphor to show that Aboriginal people are fighting and will continue to fight and will win, eventually." Carr was inducted into the Australian boxing hall of fame in 2010, joining a formidable list of legends including Lionel Rose, the first indigenous Australian to win a world title, Jeff Fenech and Kostya Tszyu. "He had a tremendous career," says Grantlee Kieza, a boxing writer with News Corp Australia. "He was one of the best fighters in Australia for a long time in the late '70s. He was tall, very rangy [and] fought most of the great Australian fighters over a 15-year period. It was just a who's who of the top boxers in Australia and New Zealand." Carr was tough to beat. "Sometimes he could be a bit lackadaisical, but certainly when fight night was on he was a formidable opponent for anyone," Kieza says. "He knew all the tricks of professional boxing, he knew how to pace himself well, but he also knew how to really get the very best out of what talent he had." But has Australia mostly ignored his accomplishments? Kieza doesn't think so. "It was just a tough time to be a fighter in the '70s because there were so many good fighters getting around. He was overshadowed a little bit," the boxing writer says. These days Carr is a grandfather, works for a rubbish collection business in Sydney, helps train aspiring young fighters and has ambitions to go on a speaking tour in Europe. Years might have passed since his last fight, but the bravado remains. "I encourage other blackfellas if you want to learn how to fight, come and see me. Yeah, I'm a genius," he says with his trademark grin.